The Diamond View Room is in the Diamond View I building at 512 S. Mangum Street (note: this is a one-way street) in Durham. It overlooks the Durham Bulls Athletic Park, which is visible from the Durham Freeway (NC-147). If coming from Chapel Hill on 147, take Exit 12, cross S. Mangum (one-way), turn left after one block onto S. Roxboro Street and go three blocks, turn left onto Pettigrew Street and go one block, turn left onto S. Mangum Street, go half a block and turn right at 512 S. Mangum into the driveway or parking deck. (You’ll see the Diamond View I building on your left.) If coming from Raleigh, take Exit 12-B, turn right onto S. Roxboro Street and follow directions above. Also see map above. 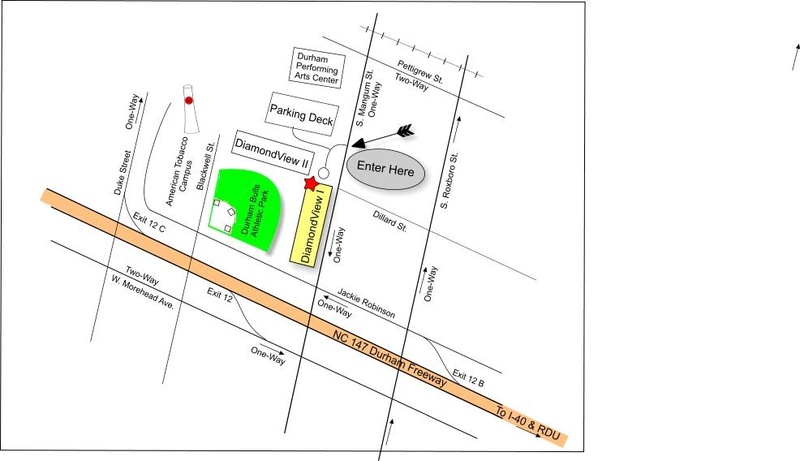 Free parking is available in front of the building and in the adjacent parking deck. For more information, see Durham Bulls.